The HP 9805 was the least expensive member of the original 9800 series and was designed for statistics calculations. It used algebraic logic with parentheses but no precedence. Unlike its larger siblings, it was not meant to be programmed by the user but ROM blocks and other expansion options were available. 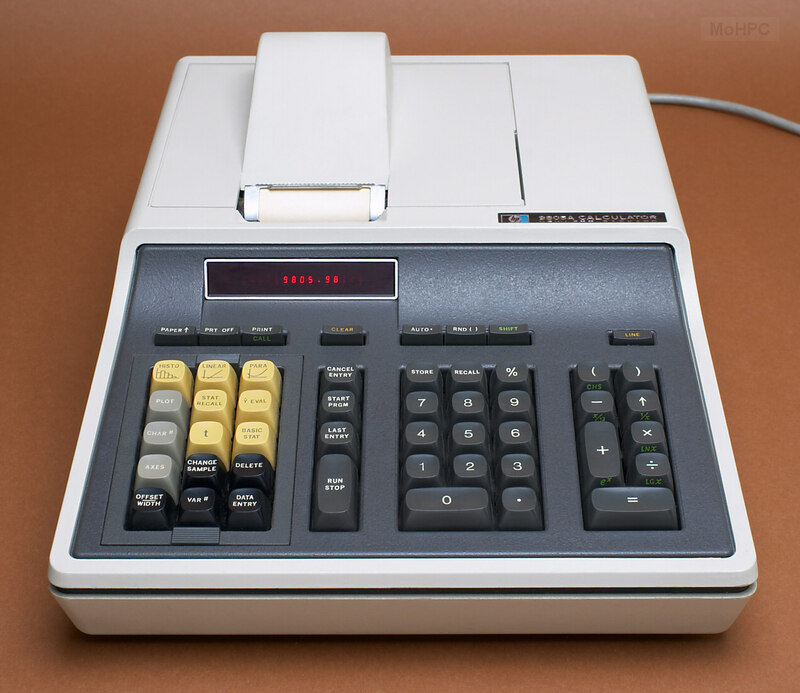 The calculator had a contactless keyboard with keys that looked and felt like those of a selectric typewriter. The impact printer used adding machine paper and printed using a red/black ribbon. In addition to the built-in printer, an LED display was optional. If the owner didn't purchase the numeric LED display, a single LED dot was still provided to indicate that the machine was busy. The case of the HP 9805 was later used for the HP-46 and HP-81 calculators. It was extremely rugged and was among the first products to be made of structural foam. A thermoplastic resin was mixed with compressed nitrogen and injected into a mold. Bubbles formed inside the plastic but collapsed as they contacted the mold wall leaving smooth skins with a cellular structure inside. The result was very strong and light - about 2-5 times the stiffness-to-weight and flexural strength-to-weight ratios of metals. Compared to non-foam plastics, they had higher rigidity and were free of the deformations that typically appear in injection-molded plastics as they shrink. Lower boundary of the cell. Relative percent frequency of the cell. The histogram could be plotted with the optional plotter. The basic calculator could perform both linear and parabolic curve fitting. With the Expanded Stat option it could also perform exponential and logarithmic regressions. The formula for the curve could be printed and the curves and points could be plotted. Estimates of Y for new values of X could also be calculated via the Y EVAL key. The calculator could could also calculate t and the number of degrees of freedom for both paired and unpaired data. (The CHANGE SAMPLE key was used to select the current data set.) The Expanded Stat Option also added One-Way Analysis of Variance and plotting of a normal curve for a histogram and plotting several or all regressions at the same time. 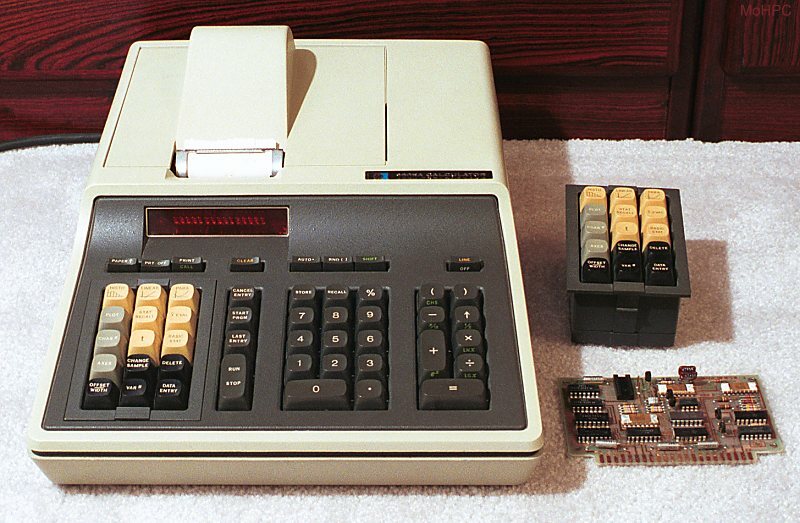 Previous 9800 series calculators had blank keys which were defined by installing a ROM block and placing an overlay on the keyboard. The HP-9805 took this idea a step further with a plug-in block of keys that also contained the appropriate ROM. The 15 keys on the left side of the machine could easily be replaced. In addition one ROM block without keys could be added under the printer cover. Functions in this block were accessed by the CALL key and other program-oriented keys on the keyboard. 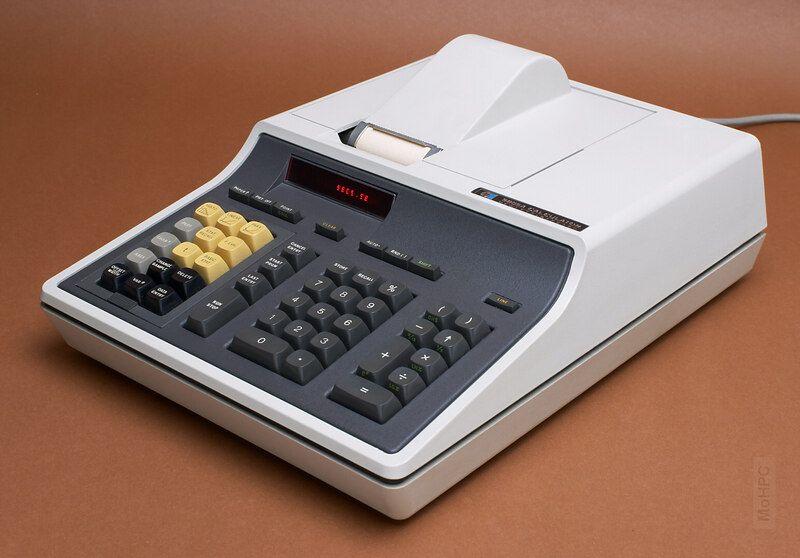 The basic calculator came with one general purpose storage register accessed via STORE and RECALL and 17 statistics registers which could be viewed via the STAT RECALL key. The Expanded Stat option added 29 general purpose registers. With the option installed, STORE and RECALL were followed by two digits in the range 00-29. The calculator also included basic mathematical functions including powers (which looked a lot like the Enter key on RPN desktops), percentages, rounding, reciprocals, common log, natural log and antilog and divide by 12. The AUTO key caused the calculator to automatically enter decimal points. The manual included 8 pages of tests to check the calculator. Also included were the formulas used, a section on accuracy, and a glossary of statistical terms.